Without a doubt a scarce date, 1885 Indian head penny value is well ahead of the more common dates that follow. When deciding on value, special attention is placed on condition. Your coin is a scarce date, perhaps it’s in a scarce condition as well. Examples displaying greater detail become very desirable and command a strong premium. With high quality 1885 pennies avidly sought by collectors, little to no wear to surfaces is very important. For example, if your coin displays sharp detail on the ribbon across the hair curls the value is at least $13 and potentially higher. 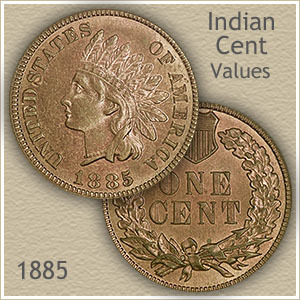 At the very top of 1885 Indian head penny value are the "uncirculated" coins. Pictured is a very well preserved penny and because of its like new condition is highly desirable to collectors and dealers. Further down the page is a section on grading the condition of your coin. Was this coin minted yesterday?.. 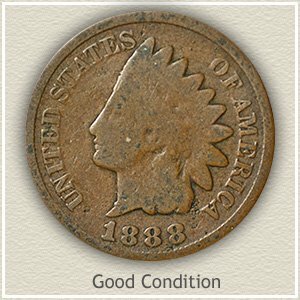 Although it appears as newly struck, careful attention to proper care has preserved an 1885 Indian penny in pristine condition. Great effort over the decades sheltering the delicate luster and color from toning resulted in a rare state of excellence. Avoiding contact with the air, to suppress toning, and avoiding contact with other coins or objects to diminish marks for so many years is rare. Rewarding the owners of this gem penny was the result of a David Lawrence rare coin auction, final price $661. Responsibility to maintain one of the top condition 1885 pennies in existence has now changed hands to another advanced collector. Your coins benefit from careful handling. Remarkably holding each by the edge when viewing goes a long way to maintaining their current value. 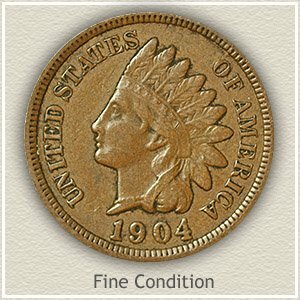 Add accurate judgment of condition and you easily determine the true 1885 Indian head penny value. Important to your coin’s value is condition. Collectors and dealers have an established system they follow and coins are "graded" by the amount of wear they have endured. You can get an idea of your coin’s condition and grade by comparing to the images and descriptions. The value chart lists separate values for each. Uncirculated: Total absence of wear is required to reach the lofty "uncirculated’ grade and value. Original mint luster is still visible over the entire coin. By tilting an uncirculated penny side to side, unbroken luster rotates across the surface. Also, inspect the high points of the design for evidence of wear. A dulling and smoothness of the surface on her eyebrow, cheek and the ends of the feathers is an indication of slight wear. Extremely Fine: Sharp detail remains on 1885 Indian pennies in "extremely fine" condition. Although some flattening from wear is evident it’s limited to only on small portions of the coin. Within the head band "Liberty" is one of the highest points of the coin and the first to wear. All letters must be present to reach the extremely fine grade. 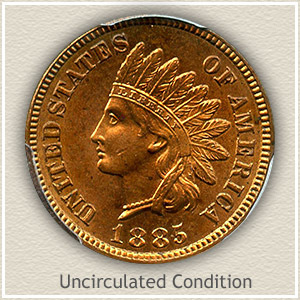 Fine: As a collectible coin, 1885 Indian head penny value is generally double a lesser grade example. Moderate wear but ample detail remaining is the appearance of a "fine" grade penny. Wear has reduced the highest details considerably but not to the point of merging one into the other. The ribbon behind her neck is still separated from the hair, although worn smooth as it crosses. The headband despite obvious wear still portrays "Liberty." Good: Extensive use has worn the majority of this coin away. Most detail separating the feathers, headband, and hairline above her face is smooth and missing. Collectors and dealers prefer a full rim if considering a coin as reaching the "good" grade. Even in this condition your 1885 penny, because of its scarcity, is still a valuable collectible. A very popular coin, everyone understands and has heard of the value of an Indian Head penny. Common dates are now worth one dollar each. Many collectors are building collections and putting a heavy demand on the rare dates and better condition coins. 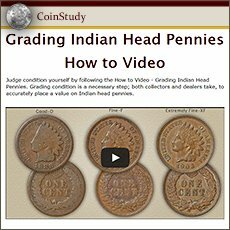 Find not only your 1885 Indian head penny value but all dates in the series are listed on the chart. 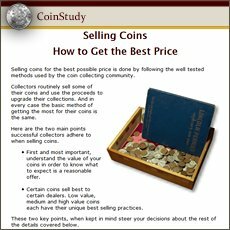 One of keys to the best price if selling and finding coin buyers is knowing accurate values.